An astonishing debut crime thriller about an unforgettable woman who combines the genius and ferocity of Lisbeth Salander with the ruthless ambition of Walter WhiteThe Crenshaw Six are a small but up-and-coming gang in South Central LA who have recently been drawn into an escalating war between rival drug cartels. To outsiders, the Crenshaw Six appear to be led by a man named Garcia . . . but what no one has figured out is that the gang's real leader (and secret weapon) is Garcia's girlfriend, a brilliant young woman named Lola. Lola has mastered playing the role of submissive girlfriend, and in the man's world she inhabits she is consistently underestimated. But in truth she is much, much smarter--and in many ways tougher and more ruthless--than any of the men around her, and as the gang is increasingly sucked into a world of high-stakes betrayal and brutal violence, her skills and leadership become their only hope of survival. This is not one of my favorite books. I love the strong heroine, but the subject matter leaves much to be desired. Despite that, I enjoyed the writing, the depth of characters and the author’s voice. The book is definitely a compelling read with a great deal of action and very little time for the reader to catch their breath. The stereo types are a bit too much to handle, but fortunately the richness of the writing surpasses that. Another con in this book is that the woman are redeemed, but the men are not. In real life, both can be redeemed, but only if they really want it, which most criminals do not, but that’s another topic for discussion. All in all, Lola is a satisfying read. 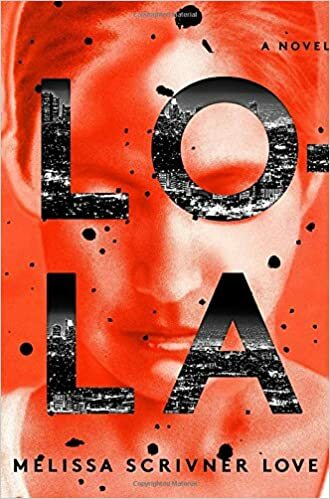 I enjoyed Lola and recommend it to anyone in need of a crime thriller to quench the thirst for blood and guts and Latin gangs. You may find the subject matter old, worn out and typical but you will find Lola anything but. I actually read this book in all of two days, which says a great deal for a book I didn’t expect much from. I look forward to reading more from this new author. Disclaimer: I received a copy of Lola from Blogging for Books in exchange for a fair and honest review. Available in eBook, Hardcover and Audible.